The upper mantle, in turn, moves about through the force of convection -- the rise of lighter fluid inside a container. Just as hot mash rises from the bottom of a still, the hot, gooey rocks inside Earth move in a three-dimensional planetary ooze. To understand how these solid-as-rock plates move past each other, you need to know about plate boundaries, where adjacent plates rub against each other. The nature of the boundary determines if earthquakes will occur, and how strong they will be. Divergent boundary: New crust is generated as two plates pull away from each other. Divergent boundaries appear mainly at spreading centers of the oceans, like the Mid-Atlantic Ridge, where hot rock, or magma, emerges, solidifies, and forms new ocean floor that starts to flow away from the spreading center. The movement is usually gradual and generally not a source of large earthquakes. Africa's Rift Valley is another divergent boundary, where the continent is gradually splitting apart. 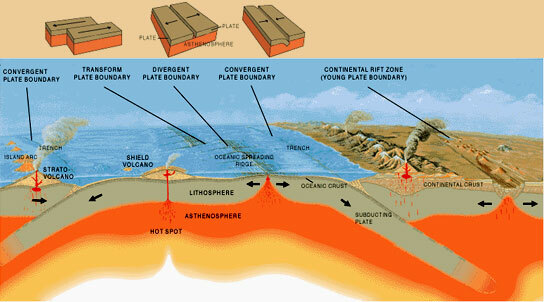 Convergent boundary: Lithosphere (crust and the upper mantle beneath it) is destroyed when the denser ocean floor plate dives under a continental in a "subduction zone" (one piece of ocean floor may also subduct beneath another). Subduction zones usually cause volcanoes and earthquakes. Examples include the Sunda Fault, which caused 2004's gigantic tsunamis, and the Cascadia Subduction Zone, along the Pacific Northwest coast, which causes a string of volcanoes including Mt. Rainier and Mt. St. Helens. Transform boundary: Crust is neither produced nor destroyed as the plates slide horizontally past each other. At the San Andreas Fault, for example, the Pacific Plate in moving north relative to the North American Plate. The San Andreas and related faults shake much of California. While the hot rock of the mantle can change shape like the gook in a lava lamp, the cold rock in a tectonic plate changes shape more like a rubber ball -- if it deforms, it tends to bounce back to the original shape. The result is that when plate boundaries at convergent and transform boundaries are stressed, they slip, grind, lurch or crunch past each other. The details of this slipping, grinding or crunching determine whether anybody outside the seismology business takes notice of the plate boundary. Boundaries can practice regular, gentle movement that relieves stress -- think yoga for the tectonic plates. Or plate boundaries can jam for decades or centuries as strain builds up. When that type of fault suddenly busts loose, people do notice, because the grinding, lurching motion can be a major earthquake. Although earthquakes occur in many parts of the world, the largest concentration occurs in a band around the Pacific Ocean, where the Pacific plate rubs up against continental plates. This band largely parallels the volcanic "ring of fire," where subduction zones have formed hundreds of volcanoes. Faults can move in several ways. Where the rock is weak, as it is along parts of the San Andreas Fault, the opposing sides may gradually creep against each other, forming weak earthquakes that do little or no damage. But when a giant rock hits an immovable object -- when one tectonic plate rams against another -- and where there is no way to relieve the stress, a major earthquake can result. What were the lessons of the great earthquake that caused the tsunamis of 2004?